A mycena something or other. Non edible. WARNING. NONE OF THE PICTURES HEREIN SHOULD BE USED FOR INDENTIFICATION. AMATEUR AT WORK. To be honest, I got a bit bored. 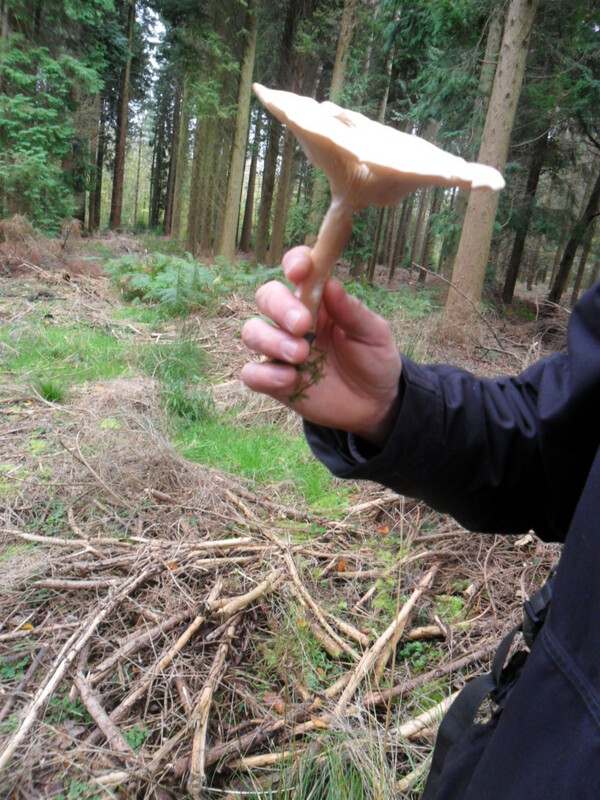 My hopes of finding Chicken in the Woods or Honey Fungus were turning to mush. 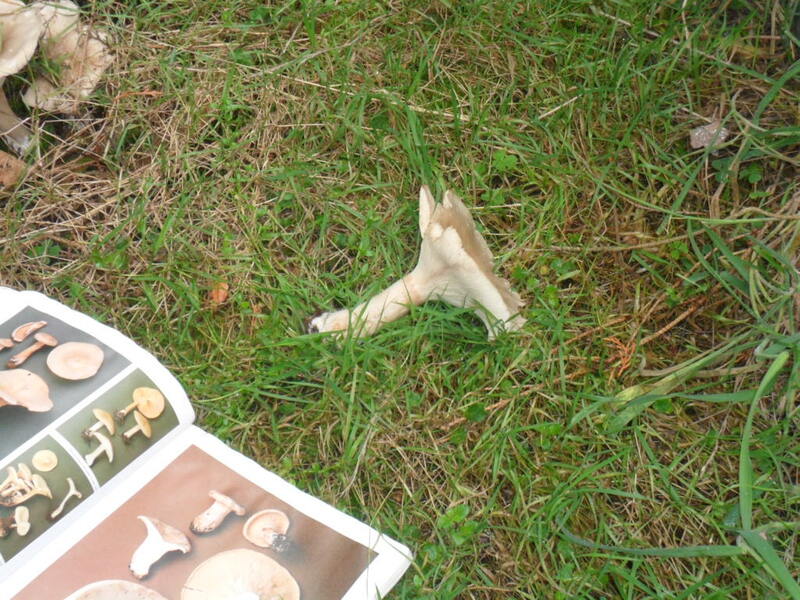 I did enjoy sniffing a stinkhorn. 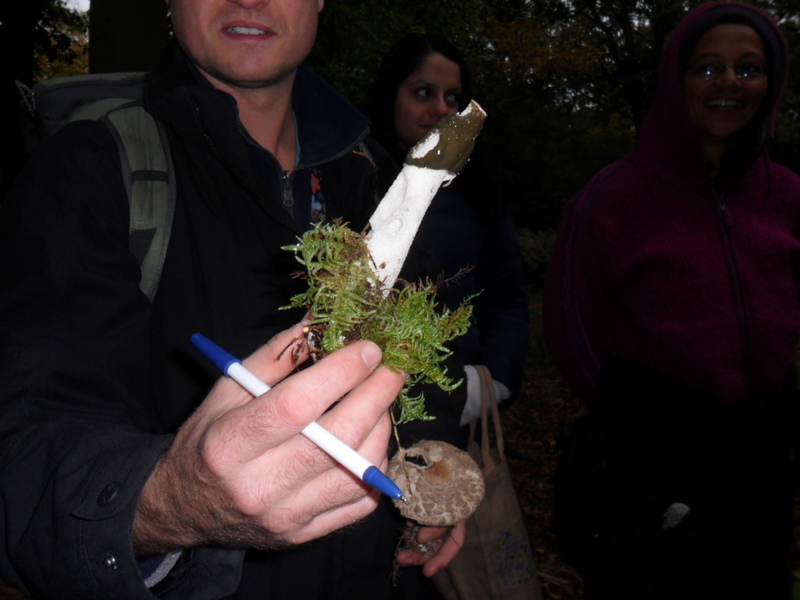 It turns out that this phallus of the forest floor smells like old flower water. Crashing through the undergrowth in pursuit of one of the two experts in the party, who didn’t mind pausing to tell me stuff such as what decurrant gills are, I noticed a patch of moss being pushed up. Clearing it back a little, I found myself being stared at by a gelatinous eye. Yesterday I might have screamed, thinking it was an alien; today I knew better. ‘Stinkhorn egg!’ I called out. 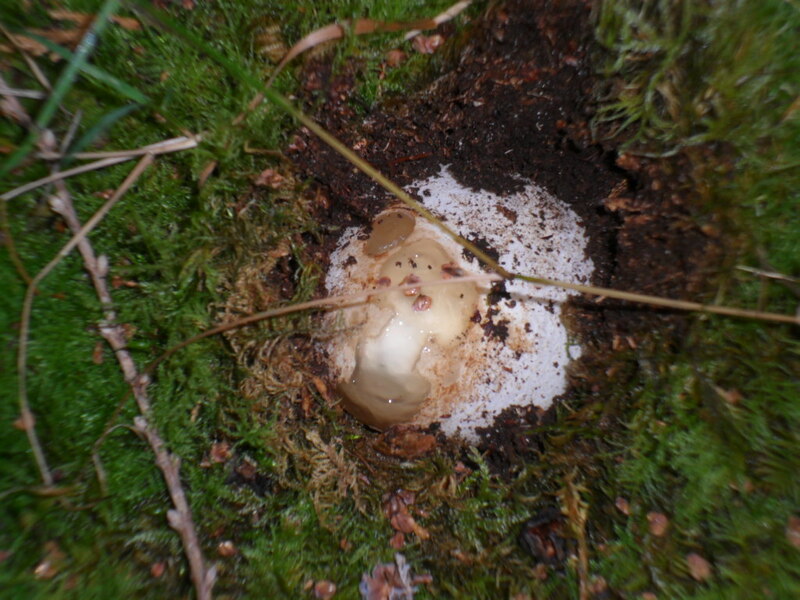 The gelatinous eye of a stinkhorn egg. There were brambles everywhere, acting as trip wires, and drains to twist your ankle in. It was drizzling cold rain. I was with people who kept coming out with stuff like, ‘I think it’s triomoplopsis.’ People who could stand root still for twenty minutes while two or more of them consulted different tomes. 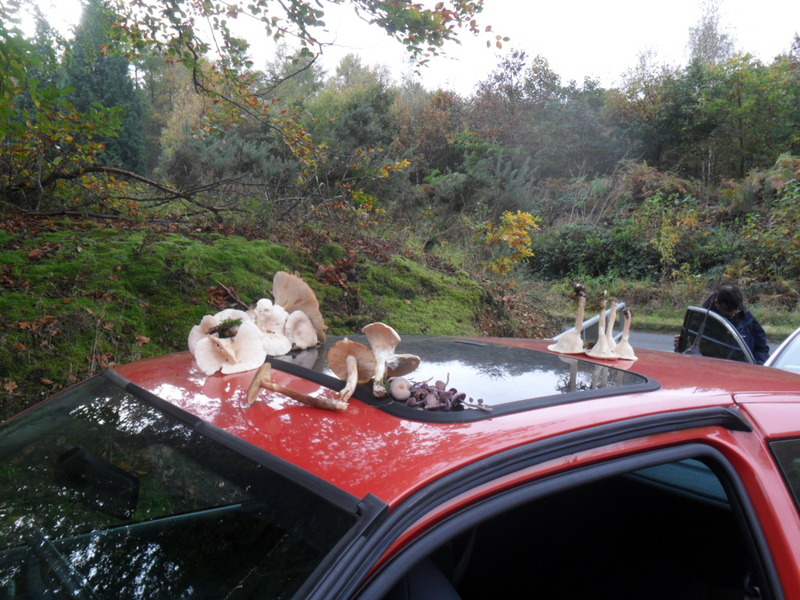 Even the experts rarely committed themselves to a formal identification, except for stinkhorns, amethyst deceivers (‘They look different every time, hence the name’) and clouded agaric. Apart from one puffball the size of a gobstopper, we went home hungry, although one person knew exactly what she was looking for. So, would we do it again? You bet. 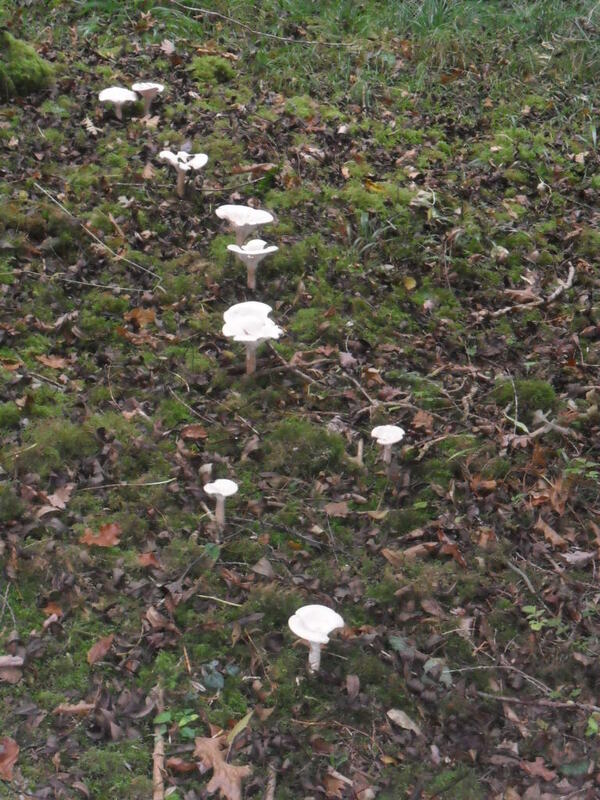 Meanwhile, I’m off to my private patches to seek blewits. 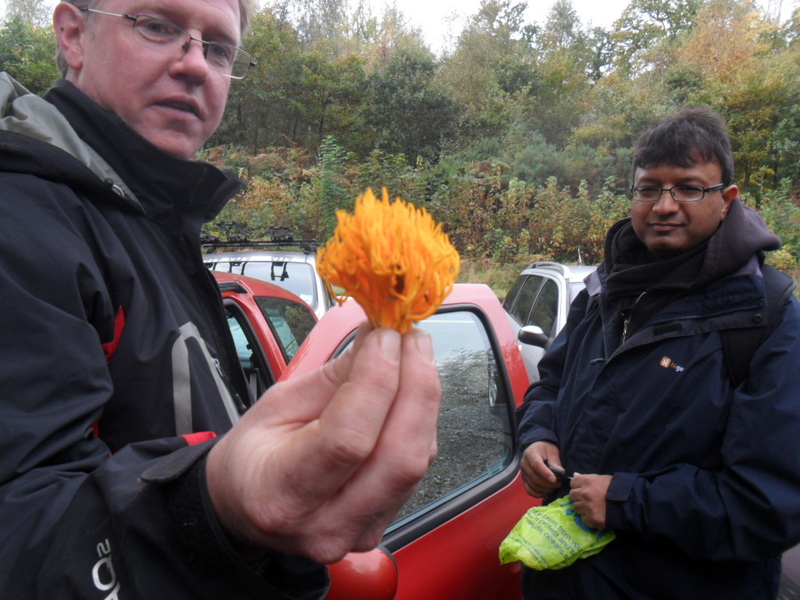 For information about future forays, see Fungus Fanaticus. I loved this, Linda. Just the sort of thing I would enjoy doing. Had a biology teacher who once told us that, in the California woods, at least, fungi growing on trees are edible, or at least non-poisonous. Don’t know if that’s so or not, as I haven’t tested that, and may even have things backwards. 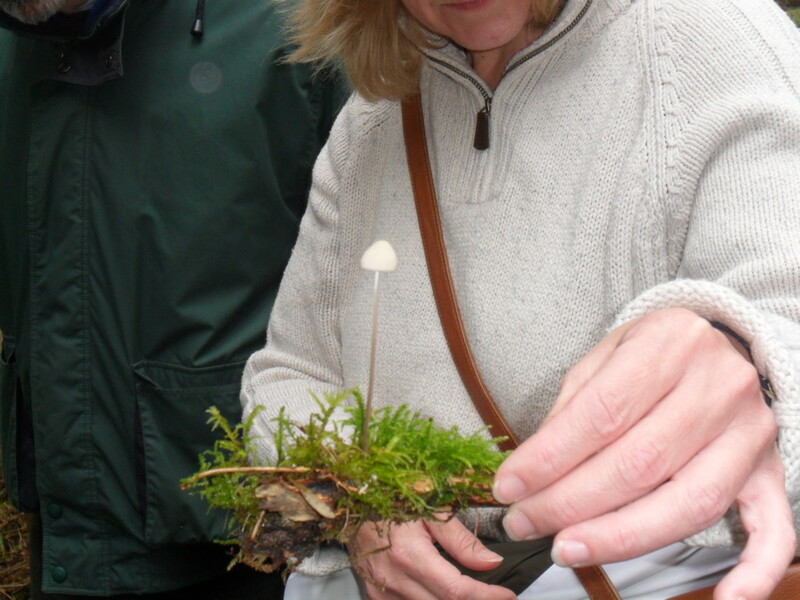 Once knew a young woman whose birth name was ‘Amanita’ – yes, after the poisonous mushroom! Her parents admired its hallucinogenic properties. Thanks, Gloria! I’ve been told never to trust generic safety rules. I’m suspicious of the ‘anything growing out of wood’ idea. On our little jaunt on Sunday we saw some quite gruesome things growing out of tree stumps! My rule (although there are no safe rules) is that the poisonous ones either look gorgeous or poisonous, alluring or repellent. Safe ones are plain (which isn’t to say that all the plain ones are safe!) I loved the story of Amanita. I heard yesterday that, without LSD, we might not have had Apple. Apparently it’s what turned Steve Jobs into a visionary but that may be apocryphal. Yes, best to be safe. That ‘visionary doorway’ thing is interesting to me, though I’ve never tried hallucinogens. Happy foraging!